Looking for a place with great food, fun and drinks in Cocoa Beach? Look no further! Cocoa Beach Sports Pub & Grill is located in downtown Cocoa Beach, Florida and is your ultimate sports bar and party spot for entertainment and food in Cocoa Beach! Open daily from 10 am to 2 am, Cocoa Beach Sports Pub offers a full liquor bar, ice cold beer, and the best Happy Hour in town. We have the most flat screen high definition TV’s on the beach, and we televise all the sports packages and sporting events including the UFC fights! 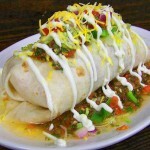 Enjoy authentic Tex-mex cuisine with that sporting event and your favorite drinks. Here at the pub they have created quite the local empire of desire for their freshly made items on the menu. You can enjoy anything from a uniquely created hot dog platter to high-class burritos and tacos that will leave you raving for more, or at the very least, raving to your friends and family to what you just ate. Nearly all of their menu items are Tex-mex inspired and created by their very own, in-house chef, just for the Cocoa Beach Sports Pub & Grill. I highly recommend the shrimp tacos as I can not seem to visit the pub without placing an order ! The pub offers free delivery to the downtown Cocoa Beach area with a minimum order of $10. Slide over to the GRILL page to view the complete menu and learn even more about the Pub’s quality food. Looking for fun things to do in Cocoa Beach? This is your place! In addition to great food, music, and televised sports events, we offer a wide variety of activities including Golden Tee, Ping Pong, Beer Pong, Outdoor Horseshoe Pits, Corn Hole, WII, PS3, weekly Texas Holdem’ tournaments, Pool, and Darts. We are always looking for new members to sign up for our weekly Pool and Dart Leagues, and our Texas Holdem’ and Horseshoe tournaments. Bring your friends and save money watching that big UFC fight. Here at Cocoa Beach Sports Pub & Grill we host monthly UFC fights, with the lowest admission in Brevard County. We also host fundraising events, cook outs, and parties for any event. Check us out on Friday nights when we showcase the best local bands, and join us on the third Saturday of each month for our monthly theme and costume parties. With beautiful bartenders, great Live Music, awesome daily drink specials and food, and all the sports packages on the most TV’s on the beach, what more could you want for your favorite Sports Pub! Cocoa Beach Sports Pub, where sports meets the beach!